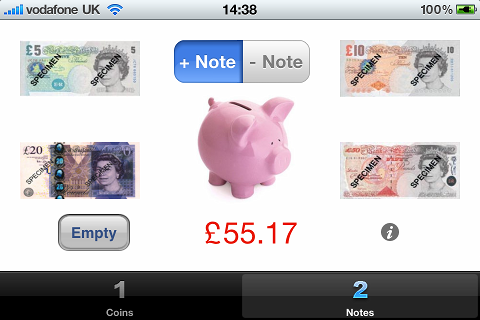 In Pocket Money Saver, the user is able to keep track of their savings in real life by pressing picture buttons that depict coins and bank notes. When pressed they increment the savings total by the value of the currency. Every time the user makes a deposit in real life they can just make a deposit in Pocket Money Saver and will always give them a virtual record of their savings.You are able to add, subtract and even reset the savings total with ease so all options are covered. 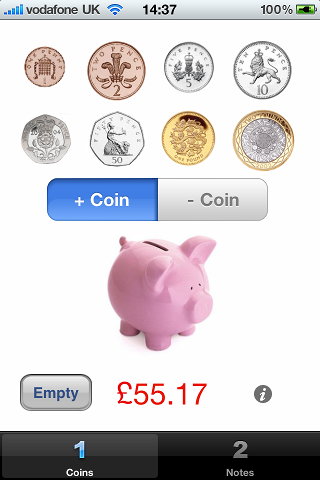 users will wonder how they ever kept track of their savings before Pocket Money Saver.We built it easy to use with buttons that depict the coins and bank Notes that add their value to your savings total.The application features not only all increments off English coins but English bank notes too. Users can add or subtract any amount of money from the savings total in Pocket Money Saver just like they would in real life. We have built this application with both children and adults in mind, as it has an easy to use interface but has depth of function adults will love.